A giant spaceship designed to fly people to Mars could also revolutionize travel on Earth, SpaceX CEO Elon Musk announced today (Sept. 29). In a follow-up Instagram post, Musk said the cost of a rocket hop between cities would be relatively affordable. "Cost per seat should be about the same as full fare economy in an aircraft," Musk wrote. "Forgot to mention that." A giant SpaceX rocket launches from a floating platform near New York City carrying passengers bound for Shanghai in this still from a video animation depicting the potential for point-to-point travel on Earth with the massive spaceship. Musk unveiled a dramatic video animation of a flight from New York City to Shanghai that began with passengers boarding a ferry to a floating launch platform. Once there, passengers entered the BFR spaceship and blasted off for Shanghai. Total flight time by spaceship: 39 minutes at a speed of about 18,000 mph (27,000 km/h). A conventional NYC-to-Shanghai flight on an airplane is about 15 hours, according to TravelMath.com. 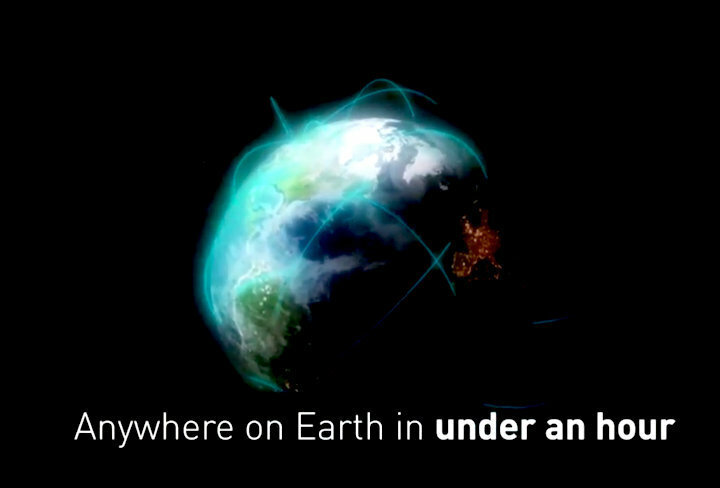 This SpaceX still from a video animation shows potential point-to-point routes for Earth travel using the company's planned Mars rocket. n the video, the BFR's first-stage booster separates in orbit and returns to land at its launch site while the spaceship itself continues to Shanghai to land itself on platform where a crane is waiting to load it onto another booster for the return trip. Musk did not elaborate on what the flight experience might be like for passengers. (Is there a snack service? In-flight entertainment? Weightless fun?) But he did say that he expected a smooth ride between launch and landing. "The great thing about going to space is there's no friction," Musk said. "So once you're out of the atmosphere … it was smooth as silk. No turbulence, nothing. There's no weather. There's no atmosphere." 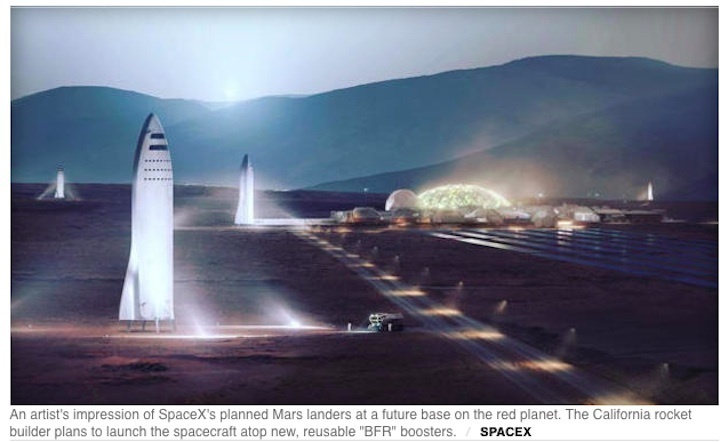 Musk first unveiled SpaceX's plans for the BFR spaceship (the letters stand for the codename Big F****ing Rocket) during the International Astronautical Congress 2016 meeting in Guadalajara, Mexico. The spacecraft is designed to be a fully reusable vehicle capable of carrying 100 people to Mars at a time, Musk said at the time. During today's presentation, he provided new details on the spaceship and how it could be used to fly colonists to a future Mars city, or visit destinations closer to home like the moon (Musk envisioned a "Moon Base Alpha"), International Space Station or low-Earth orbit, where the ship could be used to deploy satellites and clean up space junk. Musk said SpaceX is aiming to launch two cargo ships to Mars by 2022. By 2024, SpaceX hopes four ships would make the trip, with astronauts flying on two of those flights. "And if we're building this thing to go to the moon and Mars, then why not go to other places as well?" Musk said. Editor's note: This story was updated at 3:22 p.m. EDT to include Musk's comments on the cost of a point-to-point BFR flight around Earth. SpaceX plans to begin construction of a new rocket and spacecraft next year that could lead to human landings on Mars as early as 2024, scaling up technologies currently being perfected with the company's Falcon 9 family of boosters to ensure reliability, reusability and, as a result, realistically low costs, founder Elon Musk said Friday. Musk first unveiled his long-range plans for exploring and eventually colonizing Mars last year. On Friday, speaking at the International Astronautical Congress in Adelaide, Australia, he provided an updated architecture featuring a single, somewhat smaller spacecraft and more important, he said, a viable way to fund the program. "In last year's presentation, we were really searching for how to pay for this thing. We went through various ideas, Kickstarter, you know, collecting underpants," he joked. "These didn't pan out. But now we think we've got a way to do it, which is to have a smaller vehicle -- it's still pretty big -- but one that can do everything that's needed." The idea, he continued, is to make SpaceX's current fleet of Falcon 9 rockets, the yet-to-fly Falcon Heavy and its Dragon cargo/crew ships "redundant." "We want to have one system, one booster and ship that replaces Falcon 9, Falcon Heavy and Dragon," he said. "If we can do that, then all the resources that are used for Falcon 9 Heavy and Dragon can be applied to this system. That's really fundamental." The new rocket is still known as the BFR, a euphemism for "Big (fill-in-the-blank) Rocket." The reusable BFR will use 31 Raptor engines burning densified, or super-cooled, liquid methane and liquid oxygen to lift 150 tons, or 300,000 pounds, to low-Earth orbit, roughly equivalent to NASA's Saturn 5 moon rocket. By comparison, a Falcon 9 can carry about 50,000 pounds to LEO while the Falcon Heavy will be able to manage about 141,000 pounds. The initial version of NASA's Space Launch System rocket, being readied for a maiden flight in 2019, will be able to boost about 154,000 pounds to low-Earth orbit. The SpaceX Raptor engines are in active development with more than 1,200 seconds of firing time to date (for a landing on Mars, the engines would have to fire about 40 seconds). SpaceX engineers also have tested a huge carbon composite propellant tank capable of carrying 1,200 tons of liquid oxygen. The BFR first stage, like the first stage of the Falcon 9, will be fully reusable and capable of pinpoint landings back on the launch pad. "I think we can get to a landing reliability on par with the safest commercial airliners. You can essentially count on the landing," Musk said. "We believe the precision at this point is good enough that we do not need legs with the next version. It will literally ... land back on its launch mounts." The BFR upper stage, or spacecraft, features an integrated propulsion section featuring six Raptor engines and tanks holding 240 tons of methane and 860 tons of liquid oxygen. Propellant for landing on Mars or the moon would be stored in separate tanks. The front end of the BFR consists of a huge eight-story payload bay that could accommodate large satellites or, for flights to the moon or Mars, accommodations for 100 passengers. The spacecraft will have a greater pressurized volume than an A380 Airbus jetliner and feature 40 cabins, a large galley, storage and entertainment areas and a solar storm shelter. "You could conceivably have five or six people per cabin if you really wanted to cram people in, but mostly we'd expect to see two to three people per cabin," Musk said. "So, normally about 100 people per flight to Mars." For lunar missions, the BFR spacecraft could land on the moon, take off and fly back to Earth using the propellant loaded in Earth orbit before departure. For Mars flights, propellant would have to be manufactured on site by robotic refineries that would produce liquid oxygen and methane from ice and carbon dioxide in the martian atmosphere. The BFR could even be used for transportation on Earth. Musk said a ballistic flight from New York to Shanghai, for example, would take about a half hour with a cost per seat comparable to full fare economy on a commercial airliner. 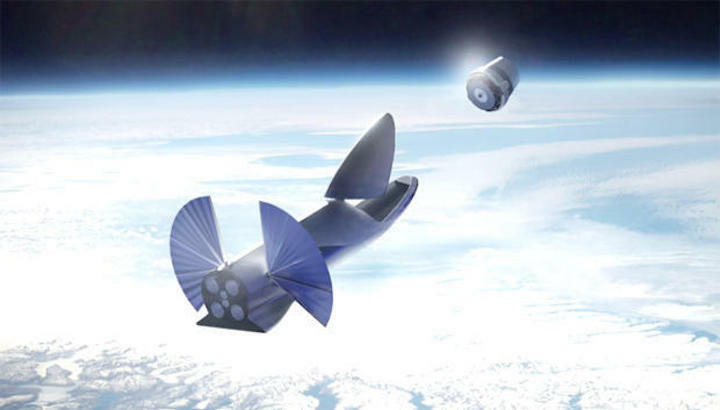 In all three cases, the BFR first stage would return to its launch site and the spacecraft would make its own tail-first, powered descents to the surface. Musk said he hopes to launch two unpiloted BFRs to Mars as early as 2022, followed two years later by four more flights, two unpiloted cargo missions and two carrying astronauts. "We've already started building the system," he said. "The tooling for main tanks has been ordered, the facility is bing built. We'll start construction of the first ship in about six to nine months. I feel fairly confident we can complete the ship and be ready for launch in about five years." While that goal is "aspirational," he said he is hopeful SpaceX can get there. If so, the goal of the 2024 flights will be to build a propellant plant on the surface of Mars. "With six ships there, plenty of landed mass to construct the propellant depot, which will consist of a large array of solar panels, a very large array, and then everything necessary to mine and refine water and draw CO2 (carbon dioxide) out of the atmosphere and create and store deep cryo CH4 (methane) and O2 (oxygen)," he said. 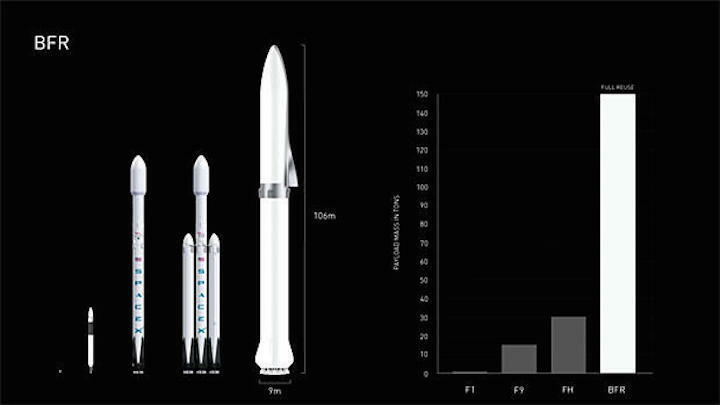 The BFR rocket will dwarf SpaceX's Falcon 1, Falcon 9 and Falcon Heavy boosters. It will be fully reusable and capable of lifting 150 tons to low-Earth orbit, says company founder Elon Musk. His oft-stated long-range goal is to establish a permanent base on Mars and to eventually colonize the red planet, making humanity a multi-planet species. Musk's grandiose vision has prompted ridicule among some long-time space engineers because of the presumed high cost and the yet-to-be-demonstrated ability to safely launch scores of missions in the rapid-fire succession required. But Musk said he believes SpaceX can do it. "If we can build a system that cannibalizes our own products and makes our own products redundant, then all the resources, which are quite enormous that are used for Falcon 9 Heavy and Dragon, can be applied to one system," he said. "Some of our customers are conservative, and they want to see BFR fly several times before they're comfortable launching on it. So what we plan to do is build ahead and have a stock of Falcon and Dragon vehicles so customers can be comfortable. If they want to use the old rocket, the old spacecraft, they can do that." 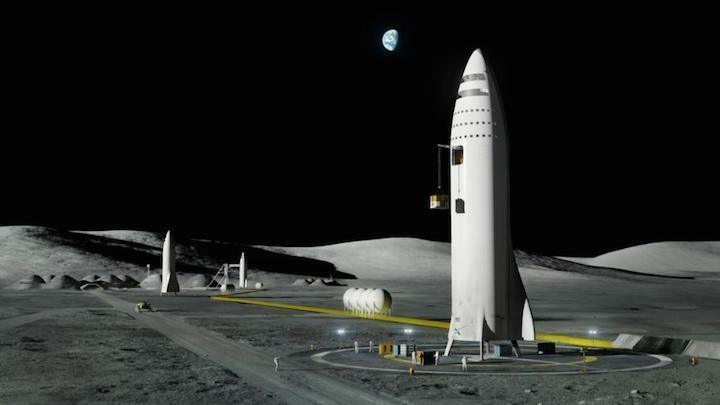 But once those stockpiles are in place, "all of our resources then will turn toward building BFR," Musk said. "We believe we can do this with the revenue we receive for launching satellites and servicing the space station." SpaceX currently has a backlog of some 70 satellite launch orders amounting to more than $10 billion. The company holds NASA contacts valued at more than $2 billion for 20 space station resupply flights and a $2.6 billion contract with the space agency to build and launch a piloted version of its Dragon capsule to ferry astronauts to and from the lab complex. The BFR spacecraft also could be used to launch large satellites. SpaceX recently won a second long-term station resupply contract, with an unspecified value, for another half-dozen resupply missions. The piloted spacecraft, known as Dragon 2, is expected to fly for the first time next year, carrying out two so-called "demonstration" flights -- the first without a crew, the second with astronauts -- before operational station launches begin in 2019. SpaceX has launched 41 Falcon 9 rockets to date -- 13 so far this year -- and completed 16 successful first-stage landings. If all goes well, the company will launch another seven flights by the end of the year, including the maiden launch of the Falcon Heavy. "Fundamentally, the future is vastly more exciting and interesting if we're a spacefaring civilization and a multi-planet species than if we're not," Musk said. "You want to be inspired by things, you want to wake up in the morning and think the future is going to be great. "And that's what being a spacefaring civilization is all about. It's about believing in the future and thinking that the future will be better than the past. And I can't think of anything more exciting than going out there and being among the stars."